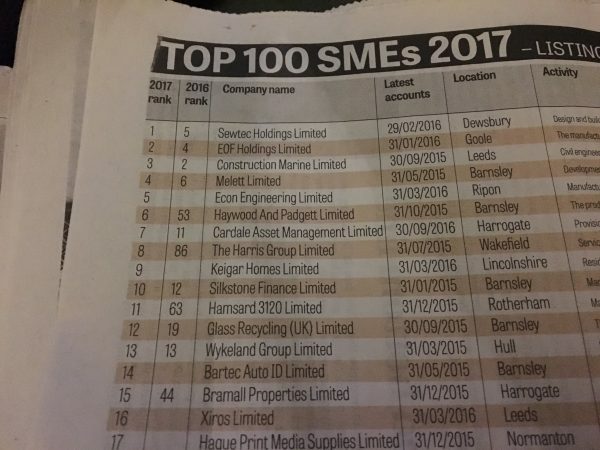 The Harris Partnership has been ranked eighth in the Yorkshire Top 100 SME rankings for 2017, and third highest in West Yorkshire. Assessed annually by BHP, the region’s largest independent firm of chartered accountants and published by The Yorkshire Post this represents an impressive rise of 72 and 43 places respectively on 2016 when we were included in the rankings for the first time. In the accompanying report, Yorkshire Post Business Editor, Mark Casci, highlighted The Harris Partnership as a ‘massive success story‘ and ‘a firm to watch in the future’.